Of all the farm toys, from barns to cows, windmills to machinery, it's the old toy tractors that are among the most popular collectibles. Whether you grew up on a farm or just wish you did, toy tractors represent the ingenuity and craftsmanship of American rural life. Until the late 19th century, farming was based on physical strength: plows were drawn by horses, mules, and oxen, and guided by humans who walked or rode behind the animals. Steam and gas powered engines appeared in the 1869s and 1870s, and by the 1880s, tractors. The word "tractor" itself is a bit of a mystery. It was used as early as 1890 by George Edwards, who patented a steam-driven farm vehicle, which gained traction by the motor's power (thus, "tract-or"). Henry Ford believed that improved agricultural equipment would advance civilization so by 1917, Ford and his son had opened the Fordson factory to produce the Fordson Model F gas-powered tractor. The popularity of the machine was enormous and soon, tractors were common farm machinery. It wasn't long after the invention of a full-size tractor that companies began to pay attention to the possibilities offered by farm-related toys. After all, in 1900 the US labor force was composed of nearly 40% agricultural workers and farmers, and millions of children were fascinated by the big, noisy farm machines. Wilkins Toy Company, located in Keene, NH. According to Bill Vossler in his book, Toy Farm Tractors, some of the earliest farm toys in the tractor family were produced there around 1886. They were horse-drawn vehicles (not self-powered tractors), but the cast iron toys were ancestors of all toy tractors and were offered by Montgomery Ward and Sears, Roebuck and Company catalogs. Hubley Company was founded in 1894 in Lancaster, PA. The company made molded metal toys that were painted and detailed at the company foundry. By the 1940s, Hubley was the world's largest producer of cast iron toys. Dent Hardware Company was founded in 1898, and produced cast iron and die-cast aluminum toys, including farm tractors. The company is still in business but manufactures hinges and other utilitarian items. Ertl was founded in Iowa by Frederick Ertl in 1945 when he began to mold tractors in his home shop while waiting out a strike at his factory job. By 1952, the Ertl company was producing John Deere toy tractors, and through the years has made die cast toys for automobile, film, and other companies. Cast iron toys were formed in carefully carved master molds, so cast iron tractors have lots of detail, with some hand finishing. Cheap modern reproductions can lack the fine details and are rarely carefully painted. Die casting was accomplished by forcing a metal alloy into a mold of the toy. Die cast items are generally lighter than cast iron, and once you see an early cast iron piece next to an early alloy tractor, the differences are obvious. Some companies reissued older toys as die cast products and these can be difficult to spot if manufactured by companies like Hubley or Arcade. Toy tractors made in Taiwan are often poorly assembled and have little detail. Tin toys had designs printed on a metal sheet using a lithography process, and details were sometimes added by skilled finishers. The toys were then folded into shape and finished. Inexpensive toy tractors have tabs holding the sections together. Other materials used included lead, wood, plastic, rubber, and aluminum. Many smaller firms are now forgotten, but the website Steel Wheels includes printed literature from pre-1930s tractor companies and is a great source for collectors. TractorData contains listings of more than 230 tractor companies and is a great resource for identifying toy tractor models. By the 1970s, the toy tractor field had exploded into a popular area of collecting and remains so with events, magazines, and fairs dedicated to the toys. Standard model sizes are 1/16 and 1/64 (although tractors can be found in 1/8, /125, 1/32, 1/50, as well as other sizes), which means that 1 inch on the toy tractor equals 16", 32", 64", etc. on the full-size tractor. Limited edition toy tractors are made in small quantities, usually as a onetime production or with a specific number of pieces. However, "limited" can mean 25 pieces or 250 pieces. It depends on the manufacturer. A shelf model toy tractor is kept in production over the years. This makes the toys generally less valuable than a limited edition tractor. Precision toy tractors are very detailed, including parts like detailed engines, upholstered cabs, and working windows. These miniature tractors are usually desired by serious collectors, and new versions allow the owner to display the toy without removing it from its original packaging. Pedal tractors are large toy tractors made for children to ride. 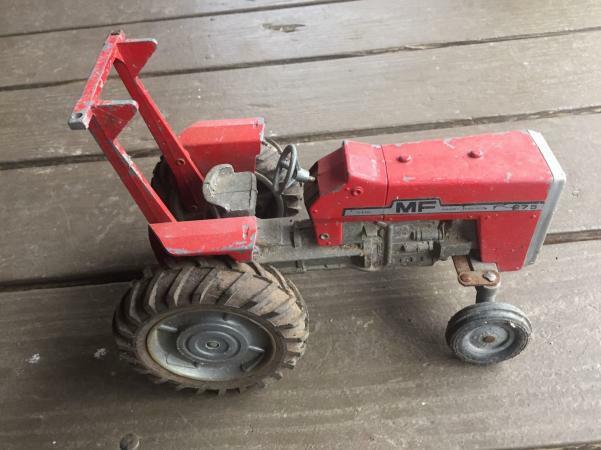 Since there are thousands of toy tractors for sale along with many new collector sets, determining rarity and value can be confusing. Recent sale prices can be checked on sites like WorthPoint (a subscription value site) or eBay, or you can begin with basic price guides and then move on to specialty guides. Experts can always be consulted in person at local antique stores or online via websites like LoveToKnow's What's It Worth? community. Copies of guides specific to toy manufacturer, like Ertl Toy Tractors by Patrick Ertl and Catherine Lee Phillips, general books on collecting farm toys, like Standard Catalog of Farm Toys by Karen O'Brien, and guides to particular tractor companies, like John Deere Collectibles by Brenda Kruse. Locate the books through various book stores and resellers, as many may not be currently in print. John Deere 430 by Ertl, was an early toy made by this classic company, and values for one new in the original box may reach above $2,000. A John Deere 630 with a harrow sold for $625. Allis-Chalmers by Arcade, 1938 with an original box is rare and has brought $1,800 at auction. Arcade's Farmall Cultivision A Tractor in the original box sold for $1,800. Among the earliest tractors produced as toys, a rare circa 1900 brass and iron steam toy traction engine tractor sold for $2,800. Among the extremely rare, an early 1/6 scale tractor (circa 1890) live steam traction engine sold in 2009 for $15,850. 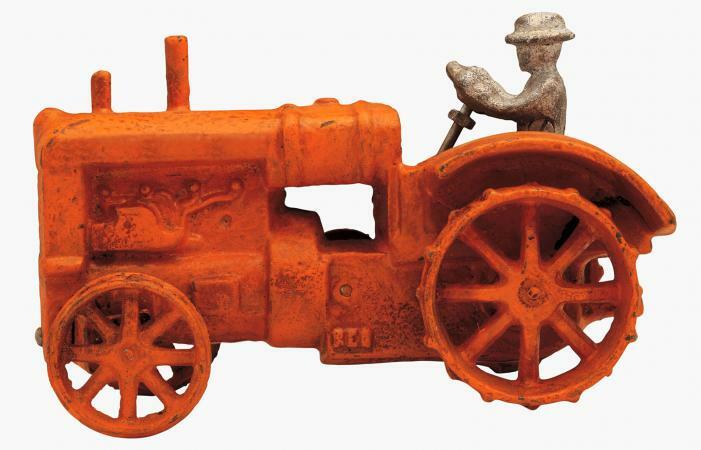 While not a toy, this piece indicates the high values that collectors pay for related toy tractor items. 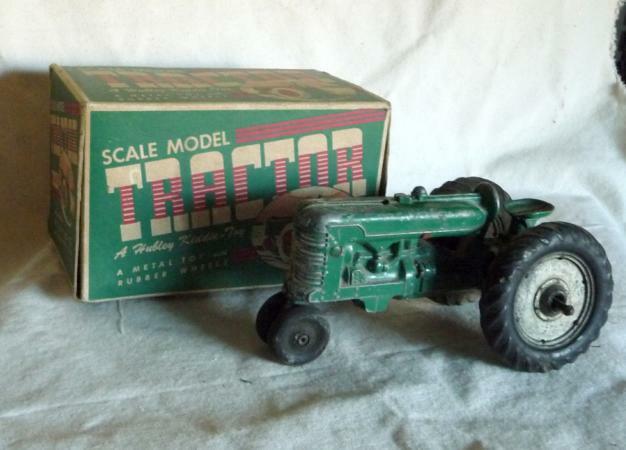 Scarcity can impact the value of a toy tractor, with examples from as early as the 1940s bringing thousands of dollars, like this John Deere A diecast model, made in that decade. Condition is based on the tractor's original issue form, so you will need to know what the original looked like before you can judge a reproduction. You can see many new and old toys at sites like The National Farm Toy Museum, and their collector's corner page shows a number of new reproductions, as well as vintage collectibles. For older pieces, web searches can turn up pieces in museums or individual collections. Take every chance to visit shows, ask questions, and examine original toys in person. When evaluating an antique or vintage tractor, consider the following: Is the paint new, scratched, chipped, worn off in places, or completely missing? Are all the pieces intact, including tires and steering wheels? Have pieces been repainted (check color, paint finish, brush marks)? If metal, is there any rust, or worn sections, and are the details clear? Is there paint inside the molded piece? Modern reproductions of older piece generally have the paint sprayed on the outside, while the originals have some paint on the interior, according to collector and writer Bill Vossler in Farm Collector. Some older cast iron toy tractors, like the Fordson, have been reproduced and those reproductions can be mistaken for the originals by both seller and buyer, notes Vossler. There are a few points you can watch for to avoid a costly mistake. Newer pieces often have thin paint, and few painted details. Reproductions are generally smaller than the original due to newer molding and production techniques. "Fins" - untrimmed corners of metal - and loose joints can indicate a reproduction rather than an original, antique or vintage toy tractor. The more recent diecast reproductions, including those by Ertl and other manufacturers, are known for their quality and details, which are very obvious when placed next to an inexpensive reproduction. Bosson Implements provides models, toys, and kits for tractor and farm implement collectors. MiniSteam offers kits, models and replacement parts for toy steam traction engines (early tractors). 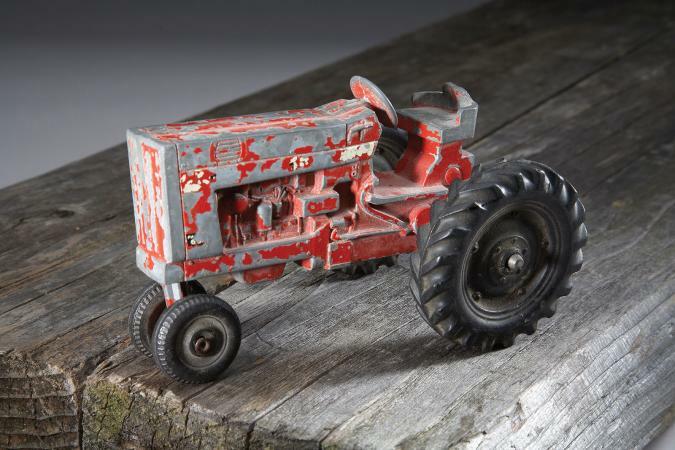 Additionally, Toy Tractor Show provides links to many dealers, and sources for toy tractor repairs and purchases; they also list toy tractor shows across the US where you can find vintage and rare toy tractors for sale. They may also have kits available at their various shows - look for an upcoming one scheduled for your area soon. If you love farming, history, and technology then collecting toy tractors may be the perfect hobby for you. It doesn't take long to fall in love with these miniature works of craftsmanship and to appreciate having a farm tractor on your shelf.